- Groom to have gold Indian wedding shoes on (photo attached) instead of bare feet. - If it looks good, if you can try to do the ceiling as dark blue with white twinkle lights (similar to starry night) – as this was in our wedding hall. - Red, gold and orange draping in background as you see fit. 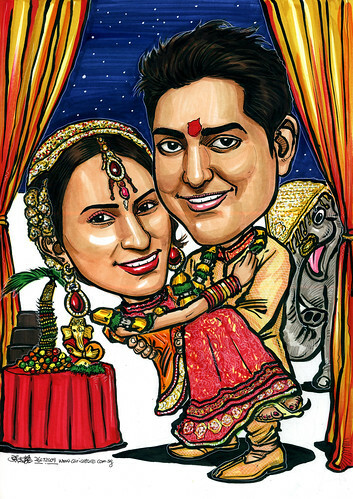 - Indian wedding elephant (similar to photo I emailed you) standing in background, can be cartoon style with a happy face! - Table with a chocolate fountain with fruit tree next to it (photo attached), and if possible, a small ganesh statue on table (like photo attached)." An order from United Kingdom. I just found out that this client made her initial enquiry in Jan this year, and subsequently decided to place her order in July. Wow! 6 months! As you can see from the above artwork, the most challenging part was the wedding gown and accessories. I took a long time, painstakingly to bring out the details in a more simplified way, and yet still a lot of effort was put in. Thank you for the excellent caricature and the wonderful service you offer! This will be lovely for the thank you cards I wish to post out to my guests. You have drawn it so well based on my instructions. I am very glad I came across your details on the internet. I have been very pleased with your professionalism and constant contact regarding my requirements. I wish you all the best with your career - and if I ever need a similar drawing doing, I will definitely contact you again!